A pure sensation for hands. 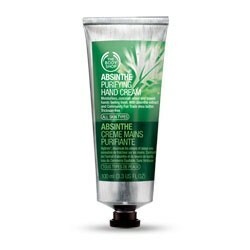 This ingenious everyday cream with absinthe extract moisturises hands and leaves them feeling soft and super-fresh. I prefer this smell to the hemp one but they are both really good quality hand creams. This scent quite unique scent,sort of clean,fresh with a sort of aromatic herbal aroma . It goes in easily and leaves my hands feeling lovely and pampered.It lasts for when I go out gardening to protect my hands and makes them feel soft and not tight at all after I use this and it smells nice too. As someone who drinks absinthe I'm still not sure of the fragrance but dont let that put you off. It really is a wonderful product that compares to L'Occitanes at double the price. Fabulous hand cream, non greasy. Not sure of the smell! Packaging looks a bit like something from a gardening shop. A brilliant hand cream that will give excellent results. "I prefer this smell to the hemp one but they are both really good quality hand creams. This scent quite unique scent,sort of clean,fresh with..."